Art Briles has turned the Baylor football program from a bottom-feeder private school in the Big XII to a safe bet to win the conference year-in and year-out in the last few seasons. It’s easy to look at Baylor now and say, “Oh well they’re always good”, but doing so undermines just how far the climb has been for this program starting with the RG3 era. (Also on a completely unrelated note, as a University of Georgia graduate in my mid-twenties there are two things that I have to do to keep my “cool UGA guy” card: a. vociferously defend Athens against all other college towns and b. support the local music scene, especially Widespread). Only a handful of college teams get to boast the return of a 1,000-yard receiver, Baylor has two. Corey Coleman and K.D. Cannon lead the most explosive receiving corps in the conference, and potentially the country. What’s maybe even more impressive than the fact that both of these guys topped quadruple-digits receiving is the fact that they did it while catching over 60% of their targets. Coleman even caught 72.7% of his targets, which is astounding for such a high-usage receiver. Jay Lee also figures to be a big part of the offense after topping 650 receiving yards himself last season, and catching two-thirds of his targets in the process. The Bears offensive line should also be strong with the play of consensus All-American left tackle Spencer Drango “Unchained” and five other linemen with eight or more career starts. The left side is especially strong with Drango and LG Blake Muir. Muir’s backup Desmine Hilliard is also an experienced option with 18 career starts. Another thing this line boasts is size, with every lineman on the team being listed at 6’4″ or taller and 300+ pounds. Behind that massive line, Shock Linwood should have a field day, yet again, in 2015. Linwood rushed for over 1,200 yards last season and 16 touchdowns. The two backs behind him on the depth chart also chipped in a solid contribution in 2014, and both are back in Waco for the 2015 season. Johnny Jefferson rushed for 524 yards and six touchdowns last season, while Devin Chafin rushed for 383 yards and eight scores. So I shouldn’t have to say any more to convince you that while Baylor has to replace Bryce Petty at quarterback, his successor, Seth Russell, is being put in a position to thrive. Russell probably has the best situation of any new starting quarterback in the country, based on both system and personnel. (Other schools that will want to make that claim include, but are not limited to: Oregon, Alabama, Auburn, and Florida State). Russell has also shown promise in the limited playing time he received behind Petty. He completed over 55% of his passes for over 800 yards and threw eight touchdowns to only one interception as Petty’s backup last season. Of course, you have to add all of the typical caveats about guys transitioning from the role of backup to starter, but between the options of having a new starter who has no experience, limited experience with poor play, or limited experience with good play; I want the last one every time. 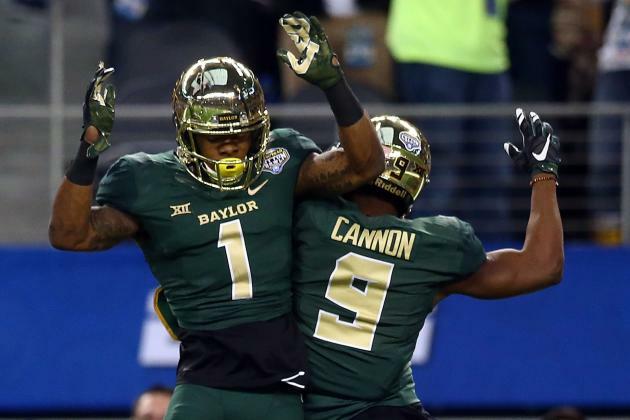 Baylor’s defense is probably most noted in 2015 for giving up 58 points to TCU despite winning the football game. That’s a little unfair, but it is worth noting that there were several other times where they gave up way too many points and made things more difficult for the offense. However, this defense has the potential, with so many players (talented ones at that), coming back. Strong and sturdy Shawn Oakman is the star of this defensive line, and is considered by many a potential top-five pick in the 2016 NFL draft. 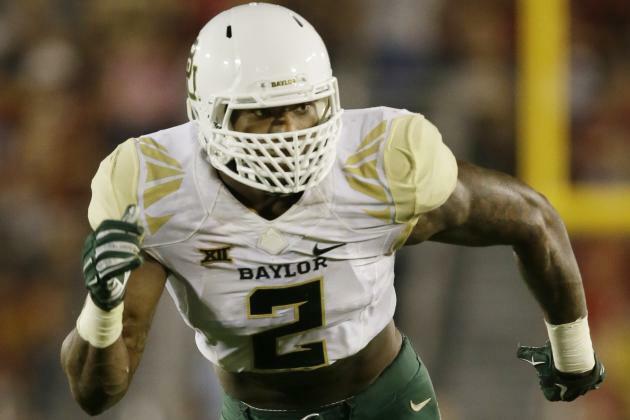 Oakman posted 19.5 tackles for loss and 11 sacks by himself last season, and looks legitimately terrifying on the field with his “Bane” facemask. Andrew Billings should not be overlooked either though, and is the force on the inside to pair with Oakman’s ferocious edge rush. Billings on had two sacks last year, but his primary job is in stopping the run, and he did have 11.5 tackles for loss. Bryce Hager will be a tough player to replace at middle linebacker, but the return of weakside linebacker Taylor Young should help. Young had 74.5 tackles, with eight for loss, four sacks and interception and two forced fumbles last season. Grant Campbell emerged from the spring as the leader to replace Hager, and while he did not have much production to speak of last season, the coaches must have seen something they liked in spring ball. It’s fair to say that the majority of Baylor’s defensive struggles, when they had them, were attributable to the secondary. That’s especially true when you consider that Baylor put a top-20 run defense on the field last season, but a bottom-20 pass defense. With most of the major contributors back in the secondary, the Baylor faithful have to be hoping that a year of continuity will help this group take a massive step forward in 2015. Orion Stewart and Xavien Howard will need to continue to exhibit their propensity for being around the ball if that step forward is to happen. Stewart and Howard had four interceptions apiece last season, and a combined 16 pass break-ups. Ryan Reid or Tion Wright are still competing to be the guy to start at corner across from Howard. Reid had no interceptions last year, but did break up twelve passes, and Wright played very sparingly last season, so he is difficult to evaluate for anyone not in or around training camp. So, for the second year in a row I’m giving the Big XII two “true champions”. Baylor has all the tools in place to make another run at a title, but at the same time I’m afraid that the secondary won’t be able to make big enough strides to not be a potential liability for at least one loss. I also believe that the most likely source for that loss is the trip to Fort Worth to play the revenge-minded Horned Frogs. November in particular will be a tough stretch with three road games against TCU, Oklahoma State and Kansas State, plus a home date with Oklahoma. My prediction for the Bears is they enter November unblemished, but don’t come out that way. I have them just missing the playoffs and meeting an SEC team in the Sugar Bowl.